Home of Revolutionary War leader; and his son John, Congressman & state legislator. House moved and restored 1966-70 by the Tryon Palace Commission. 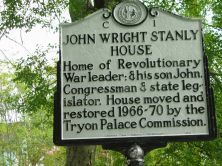 The house of John Wright Stanly, entrepreneur and patriot, embodies historical significance and architectural grandeur. Although Stanly purchased land to build upon in 1779, it was not until 1787 that the residence was completed. Many consider the house in New Bern the finest example of late Georgian architecture in the state. Much like the man who built it, the Stanly House was important in both New Bern and North Carolina history. John Wright Stanly was born on December 18, 1742, in Charles City, Virginia. A successful merchant, Stanly became wealthy through maritime trade during the Revolutionary War and contributed large sums of money to the Patriot cause. After the war, Stanly turned to civil matters and was named first president of New Bern Academy. In 1789, both John and wife Ann Cogdell died of yellow fever, leaving the house to eldest son, John Stanly, who took legal possession in 1798 when he reached majority. During the time between Stanly’s death and his son’s acquisition of the house, it remained vacant. 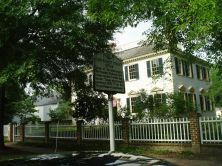 On George Washington’s southern tour, the president visited New Bern for two days in 1791, and was entertained at the Stanly house and at nearby Tryon Palace. John Stanly Jr., born in New Bern in 1774, was a prominent politician, serving terms in Congress and eventually as Speaker of the North Carolina House of Representatives. In recognition of his political contributions, Stanly County was named in his honor. Stanly is infamous for the murder of former North Carolina governor Richard Dobbs Spaight in a duel behind the Masonic lodge in New Bern on September 5, 1802. Spaight’s murder prompted North Carolina to pass legislation banning duels, although such acts of rivalry and honor were common until well after the Civil War.